There is no better compliment than imitation. If that’s the case, the automotive industry is full of flattery. That’s as true in the U.S. as it is within the unimaginative shores of China, where car designs are stolen like glances at a Victoria’s Secret fashion show. Part of the reason for automotive parallels in the Western world is the simple fact that there are only so many car designers to go around. Once a successful design has been penned and millions of cars sold, the designer is lured to another company to create the same look with a different brand. Who’s the next copycat on deck? It appears that Mercedes-Benz will get that honor, as it just grabbed the leader of another German automaker’s design studio. Before we get into that, let’s take a look at a couple of recent high-profile copies. 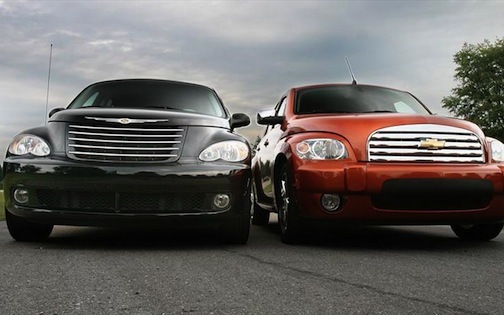 The 2001 Chrysler PT Cruiser was introduced, to great success, as a retro-styled sedan as the world entered a new millenium. The designer, Bryan Nesbitt, was hired away by General Motors and promptly came up with the design for the 2006 Chevrolet HHR, as pictured above. Well, played, sir. Well played. Ford owned luxury carmaker Aston Martin until 2007. The iconic Astons always had a look all their own, until the company’s former owner decided it liked the design and copied and pasted the grille onto the front of cars such as the 2013 Fusion. What’s not to like about exotic British looks for the price of an American Ford? Next up we could see some Audi showing up in the looks of cross-country rival Mercedes-Benz. Besides having the hardest name ever to spell, Achim Badstuebner will move from Munich to Stuttgart to lead Mercedes-Benz’s exterior design department after leading Audi’s design studio for 13 years. In truth, Badstuebner’s job isn’t likely to change at all. He’ll still be designing Audis—they’ll just have the MB logo on them. Are there any unique car designs any more? This entry was posted in Car Industry News, Car Lists, Car Minded, Domestic Cars, Foreign Cars, General Chat, United States and tagged Achim Badstuebner, aston martin ford, audi designer, car design, car look-alikes, chevy hhr, chrysler pt cruiser, mercedes-benz. Bookmark the permalink. The problem with the HHR was that it took GM so long to get the car on the market that people were already tired of the retro look and PT sales were falling. Typical for GM. Nowadays, it seems half the cars have rear ends that look like BMW. A decent look, the bustle trunk gives more room and better aerodynamics, but with the pinched-off taillights appearing on everything from ford to Hyundai, it’s a bit overdone. there are still a couple unique cars, how about the scion xb. It may be a love/hate design but all truly unique vehicles are. Some other cars that look like each other (at least from behind) are the mercedes benz glk (2011) and the toyota highlander (2007). things on the road are starting to look more homogenized, but there are still some fresh designs out there. Also whatever happened to full range color palates for vehicles, silver, black and white are not enough! ← 2015 Chevy Colorado Revealed!